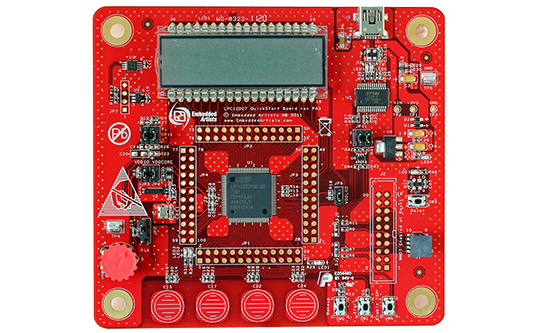 The LPC12D27 QuickStart Board lets you get up-and-running quickly with NXP's Cortex-M0 LPC12D27 microcontroller. NXP's Cortex-M0 LPC12D27 microcontroller in 100-pin LQFP package. 12.000 MHz external crystal. The LPC12D27 runs at frequencies up to 45 MHz. All LPC12D27 pins are available on expansion connectors around the processor (100 mil/2.54 mm pitch dual rows). UART-to-USB bridge interface for LPC12D27 UART, with mini-B USB connector and proper ESD protection. Flexible powering, with on-board 800mA 3.3V voltage regulator. Can be powered from USB connector, JTAG connector (if supported by JTAG device) or an external +5V supply. Support for '555' hardware timer functionality of the LPC12D27. Push-button for enabling Bootloader mode of the LPC12D27. Push-button for enabling start logic of the LPC12D27. Push-button for wakeup logic of the LPC12D27. Possibility to measure current consumption for LPC12D27 core, I/O and LCD controller parts individually. 3 LED on pin PIO0_12, PIO0_27 and PIO0_28.